The Villages Recreation and Parks Department Has Been Nationally Accredited Since 2011! The Commission for Accreditation of Park and Recreation Agencies (CAPRA) accredits park and recreation agencies for excellence in operation and service. 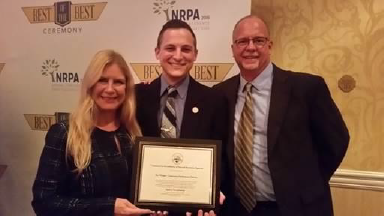 Charged with providing high quality services and experiences, park and recreation agencies across the United States turn to CAPRA Accreditation as a credible and efficient means of achieving these goals, while providing assurance to the public that the agency meets national standards of best practice. Accreditation is currently based on an agency’s compliance with 151 standards in ten different categories. The Villages Recreation and Parks Department received its initial Accreditation in November of 2011, following a two-year process that was a team effort by recreation and district staff and the Developer. CAPRA requires accredited agencies to go through a review every five years in order to maintain their status. In 2016 we were re-accredited, passing 100% of the standards. As of October 2018, The Villages Recreation and Parks Department is one of only 166 accredited recreation agencies out of over 10,000 agencies nationwide. We look forward to our next re-accreditation in 2021!